I’ve pursued photography for a year and a half and am loving the process, the work and the images I’m creating, but what surprises me most is this: I’ve learned about dealing with vitiligo through photography. Here’s how it began: When I learned that a regular guy like me could make a picture of the Milky Way, the astronomical feature that’s visible to the naked eye, with regular camera gear I was entranced. I read, searched and practiced Astrophotography until I finally captured my first image of the Milky Way in April 2017. I was elated, excited and encouraged. I put in the work and kept working at it. And I still am working on being a better photographer and artist. I love the challenge and loving challenges is a challenge all itself. As I’ve learned photography I’ve come to see many parallels with the process of learning to love myself, as I am, with vitiligo. I have vitiligo and I love vitiligo. It feels strange to say and powerful too: I love vitiligo. Coming to accept life & vitiligo as it is and to accept it fully I needed to truly love vitiligo. This acceptance allows me to have a healthy approach to dealing with vitiligo much in the same way that loving life allows me to have a healthy approach to living life. Vitiligo makes me a better photographer, and being a photographer is making living with vitiligo into a rich experience, filled with strange and wonderful gifts. I’ll be unpacking a few lessons about living with vitiligo that I’ve learned through photography. For a while, I’ve been putting together a program to explain my approach to getting over having vitiligo and getting on with life. It’s a collection of what I’m calling the Vitiligo Rules. Here’s Vitiligo Rule #53 which I learned while becoming a photographer: the level of work you put into overcoming the challenges in your life informs the level of joy you feel once you overcome those challenges. The joy I feet under the stars capturing the Milky Way in my camera is a big joy because my effort was big. 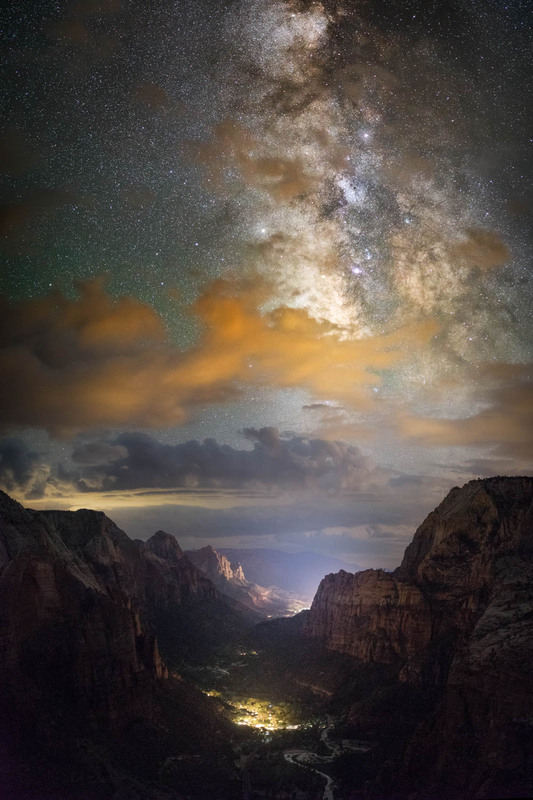 This shot was made in Zion National Park at Angels Landing. The hike is one of the best that I can think of. Nervous about the clouds ruining the shot, I waited impatiently for the stars to came out. When the stars appeared, the Milky Way was aligned Loving challenges is a challenge all itself. above the canyon and there was just enough time to make two compositions. The location, how to get there, when to arrive etc. It took hundreds of hours of learning to be able to create the shot. Lots of images that were terrible. Many cold and windy nights that did not result in a image worth sharing. But it was worth doing because I was learning something I wanted to learn. It was worth doing because I was on a path to create something beautiful. Along the way I made many images that I love. Many of them you can see on my here. And because I was having fun even though there were and still are many moments that are not so fun. Learning to deal with vitiligo is similar. I loved the idea of creating a beautiful image, so I pushed myself. I love the idea of living a life that I love, so I push myself. What are the things that hold me back? What are the skills that I can learn and apply to have a full life? What are the challenges that I need to face and overcome to have a full life? What does it take to connect with people as they are and as I am? You want to get past the pain and frustration that can come with having vitiligo? It’s a challenge. And that challenge can be met with effort. Much effort equals much joy. Are you ready to take the challenge? I’m launching a new Instagram account call I Love Vitiligo. It’s for those of us with vitiligo that want to love life. I’ll be posting there soon.